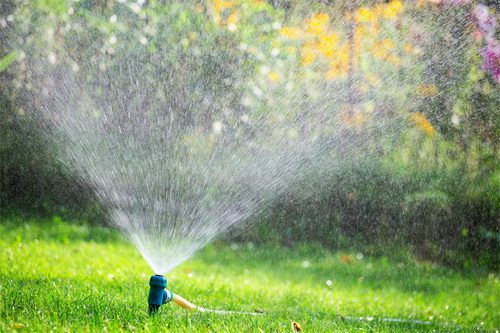 When your sprinkler system stops functioning properly, the plants and grass that rely on the water it delivers become at risk of suffering from a drought. Kable Landscaping provides comprehensive sprinkler system maintenance to help ensure that your sprinkler system functions properly and delivers as expected. Many problems with sprinkler systems can be attributed to poor winterizing practices. Water left in a line can cause considerable damage once it becomes frozen in the winter and expands in a pipe or sprinkler head. We offer sprinkler system maintenance for properly winterizing your system, as well as service to diagnose and repair whatever ails your sprinkler system. There are numerous reasons why your sprinkler system may be on the fritz. The solutions to those problems are answers we can provide. Our comprehensive sprinkler system maintenance service considers anything and everything that might be causing issues with your system. We’ll give you honest answers for what is causing your problem. For a multitude of reasons, a sprinkler head can malfunction. Due to the commonality of this problem, faulty heads or parts can be quickly fixed or replaced. Sometimes malfunctioning sprinkler systems can be easy fixes, where the head just needs to be cleaned. Being surrounded by dirt and out in the natural elements, sprinkler heads will naturally get clogged with dirt on occasion. The head can simply be twisted off, cleaned out, and placed back on to the system with ease. Some sprinkler system malfunctions can be difficult to pinpoint. In some cases, however, it can be as simple as making sure the backflow valves are in the correct position. And sometimes backflow valves may be the cause of low water pressure. When it comes to sprinkler system malfunctions, sometimes a simple pinhole leak can cause a world of problems in your sprinkler system. However, pinpointing the source of a leak can luckily be left up to our technicians, who will be able to solve the problem and resolve any issues you may be having. Call Kable Landscaping today at (989) 695-5222 to talk to us about sprinkler system maintenance for your home or business. Whether you need immediate attention given to a malfunctioning system or would like to talk about winterizing your system in the fall, we’d love to hear from you!